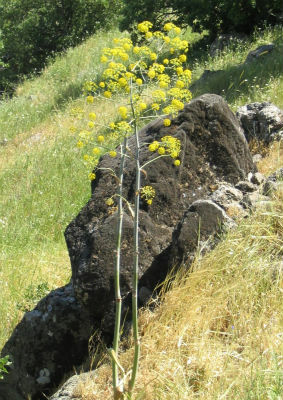 In Greek mythology, a thyrsus (thyrsos) was a staff of giant　fennel (Ferula communis) covered with ivy vines and leaves, sometimes wound with taeniae and always topped with a pine cone. His attributes included the thyrsos (a pine-cone tipped staff), drinking cup, leopard and fruiting vine. The wine and revelry god Dionysus and his followers carried a thrysos. This was a special staff twined with ivy. 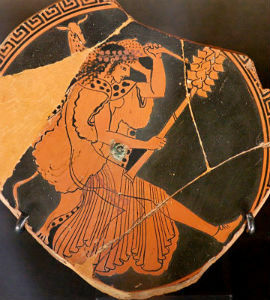 Sometimes the thyrsos is shown with a pine cone on top. As female votaries of Dionysos, maenads abandoned themselves to orgiastic festivities.